Actually, many older students benefit from taking this course as well, since previous writing work might have been spotty and the review and revision is invaluable. The other regular writing course offerings are similar in scope and time, becoming more focused on truly understanding and mastering the various types of writing and receiving feedback and criticism for improvement. Besides the many regular writing courses offered, Brian Wasko, creator of Write At Home, offers online Classic Literature classes called Wasko Lit. The Lit 1 Syllabus includes Mythology by Edith Hamilton, The Illiad, The Odyssey, plays by Aeschylus, Euripides, some selections from Plato, C.S. Lewis’ Till We Have Faces, other works and Julius Caesar by Shakespeare. This is the heavy-duty study that homeschoolers are known for and many adults wish they could have enjoyed such an extensive course in the comfort of home! 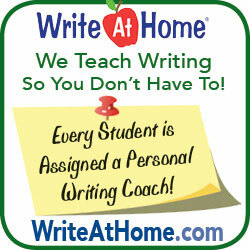 Write At Home should be a part of every homeschooler’s education. Please visit the website to see complete information and enroll your student right away! E.S.